authorship of many of the Psalms. King David reigned for many years in Israel from his capital, Jerusalem. The City of David remains to this day and remains of the old buildings can be seen. 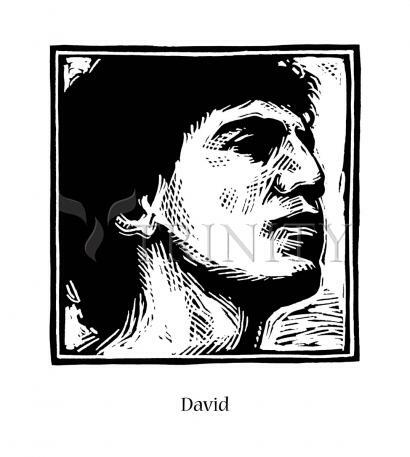 David, the son of Jesse and descendant of Ruth, became king of Israel after the death of the rebellious Saul, and thus began the golden age of Israel. This powerful king wisely governed the tribes of Israel, forging them into a united nation. God blessed this man to be a valiant soldier, a great military strategist, an able administrator, a diplomat, a composer, a musician and king. He extended Israel’s lands in the north (1 Chron. 18:3, 14), triumphing over Israel’s enemies the Canaanites and the Philistines. Prosperity followed, which is confirmed today by archaeology. “The reign of David marks — politically speaking — Israel’s golden age. A power vacuum in both Egypt and Mesopotamia made it possible for the tribes that had entered Canaan under Joshua a few centuries earlier to become a mighty nation... David was king of an area extending from the Red Sea to the Euphrates” (The International Standard Bible Encyclopedia, Eerdmans, 1982. Vol. II, p. 915). David was originally based in Hebron in southern Judah, but when all 13 tribes of Israel accepted his rulership he needed a central location from which to govern. An ideal place was on the northern border of Judah, the city of Jebus, also called Jerusalem (City of Peace), but the Jebusites (Canaanites) held the city (1 Chron. 11:4). The city was built on a hill and seemed impenetrable. But David found a way to enter the city, via a water shaft. He said that whoever could enter the city would become the commander of his army, and Joab the son of Zeruiah went up the shaft and thus David conquered the city, and called it the City of David (1 Chron. 11:6-7). On Mount Moriah, next to the city, he moved the Ark of the Covenant, and there his son Solomon later built the first temple. Earlier in life, before becoming king, David accomplished a great victory over the Philistine enemies during the time of King Saul. At age 17, he was summoned by King Saul to the battlefield to play music for Saul. Meanwhile the giant Philistine Goliath taunted the Israelites and dared them to send out their strongest soldier to do battle, a one-on-one battle to prove which side was the strongest. Of course, Goliath, being about 320 cms tall, had no doubts he would win. Although he had never been a soldier, David was so shocked to hear Goliath’s insults and the lack of action by the Israelites that he was moved to do something. He approached Saul and recounted how he had killed a lion and a bear that had threatened his family’s sheep, “and this uncircumcised Philistine will be like one of them, seeing he has defied the armies of the living God... The LORD, who delivered me from the paw of the lion and from the paw of the bear, He will deliver me from the hand of this Philistine” (1 Samuel 17:36). Saul offered David his armor, but it was too big and heavy for David. So he went out to battle with his sling, some pebbles and his staff. When Goliath saw how small young David was, he mocked him, saying “Am I a dog, that you come to me with sticks? ...Come to me, and I will give your flesh to the birds of the air and the beasts of the field!” (1 Samuel 17:43-44). David’s response: “You come to me with a sword, with a spear, and with a javelin. But I come to you in the name of the LORD of hosts, the God of the armies of Israel, whom you have defied. This day the LORD will deliver you into my hand, and I will strike you and take your head from you. And this day I will give the carcasses of the camp of the Philistines to the birds of the air and the wild beasts of the earth, that all the earth may know that there is a God in Israel (verses 45-46). David rushed forward, took a stone out of his bag, and slung it at Goliath. It struck the giant’s forehead and he fell over, and David then took Goliath’s sword and cut off his head. The stunned Philistines then fled as the Israelites routed them. Earlier, the prophet Samuel had anointed David, youngest son of Jesse, to be king after Saul died. Saul was impressed by David and had him work for him as his musician and as a soldier. Eventually though, Saul was jealous of David and tried to kill him. David fled to the Philistines and others who did not like Saul joined him. At one point, David was hiding in a cave at En-Gedi (by the Dead Sea), when Saul entered the cave to relieve himself. David had the opportunity to kill king Saul and take the throne, but David refrained, because his character was so strong. He was a man after God’s heart (Acts 13:22). David refused to kill Saul on numerous occasions, despite his army chiefs suggesting he take over right away by killing Saul. When Saul finally died in battle, David was sad, but he knew his destiny and returned to Judah where he was made king over Judah. Eventually the other tribes of Israel accepted him and he ruled the whole nation. David did much more than all this of course, and you can read for yourself about his life in the Bible, especially in 1 Samuel, 2 Samuel, 1 Kings and 1 Chronicles. He was also an ancestor of Jesus Christ (Matthew 1:1), and today the Royal Family of England are also descended from him. Queen Elizabeth II is of the House of David, of the tribe of Judah. Her throne in London will eventually be taken over by the Son of David, Jesus Christ the Messiah, when He returns to the earth in power and glory (Revelation 11:15; 19:11-16). What a wonderful future we have in store with the Kingdom of God ruling the earth rather than man-made governments and kingdoms which do little to improve the standards of living for all mankind.